I had so much fun making Erik's Birthday cake that I decided to make some more. Over the last several months I have made a few birthday cakes for my family and friends. I love getting to be creative and design a cake specifically for that person. My dad loves chocolate cake donuts with chocolate frosting. 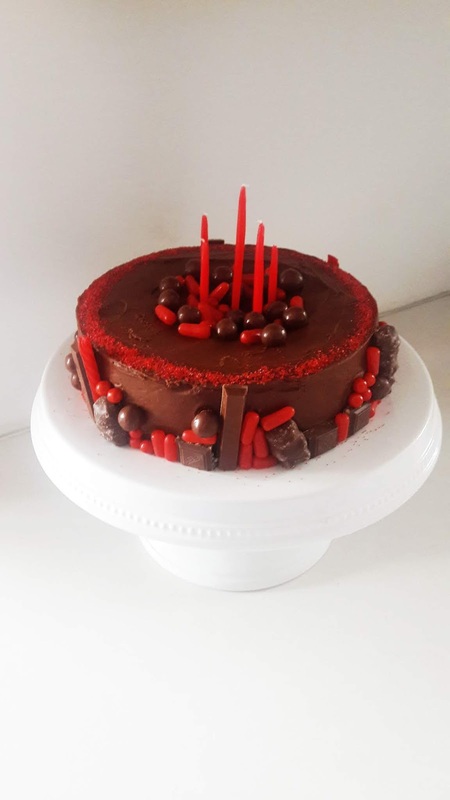 I thought a chocolate cake with chocolate buttercream frosting would be the perfect birthday treat for him. 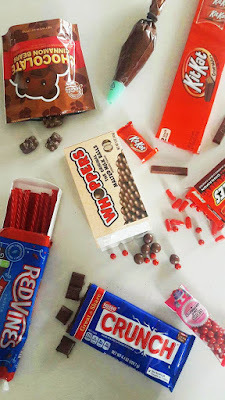 Hot Tamales, Crunch Bars, Kit Kats, Cinnamon Bears, Red Vines, and Whoppers. 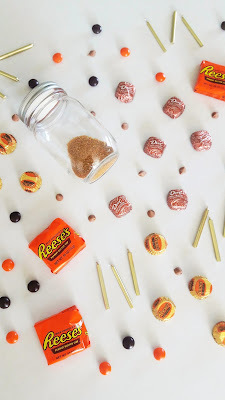 It worked out perfectly as the candy flavors all ended up being chocolate or cinnamon. The flavors meshed well together and it created it's own color scheme, red and brown. I created a candy border around the base of the cake and made it in varying heights. In the center of the cake I added a large pile of the candy. 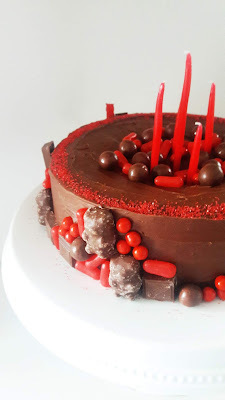 I added a few red candles to the top and a few red sprinkles around the edge of the cake to pull it all together. My sister loves chocolate and peanut butter treats. 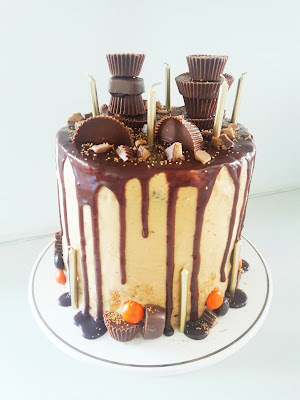 So I decided to make her a chocolate cake with peanut butter frosting. 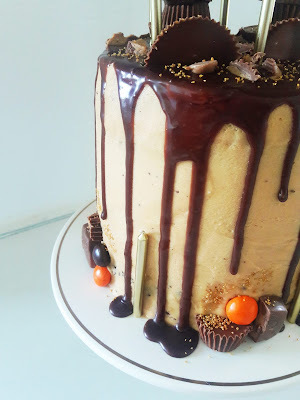 Since the frosting was a light brown I wanted to add a chocolate ganache on top of the cake so the decorations would stand out better. I added the ganache to the top of the cake and helped it trickle down the sides for a dripped effect. Reese's, Peanut Butter M&M's, Dove Peanut Butter Promises and Peanut Butter Chocolate Chips. 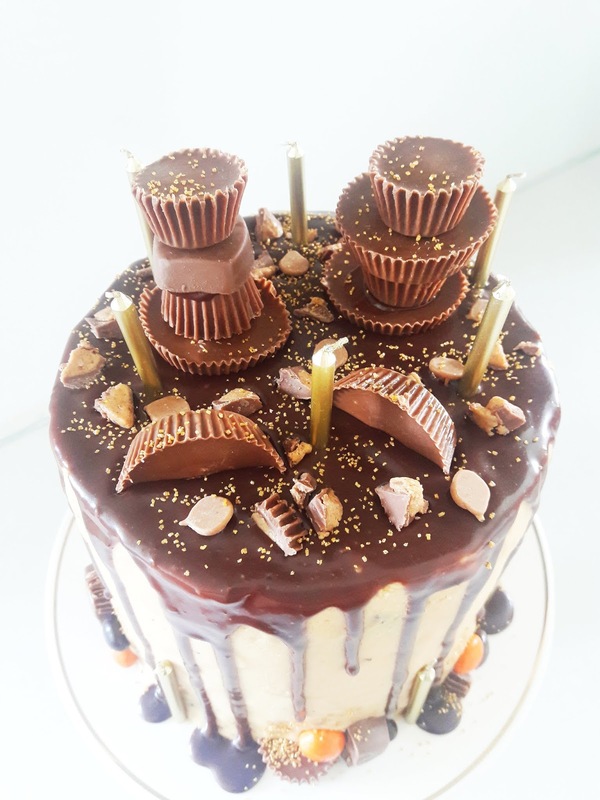 I stacked a few pieces of candy on top of each other and placed them on top of the cake to add some height. 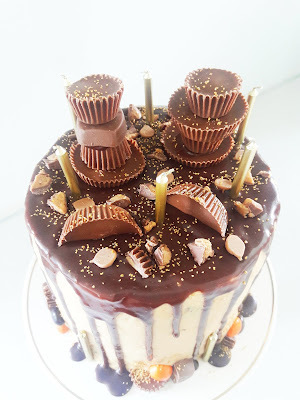 I added the remaining candy to the sides and top of the cake. The colors took on a beautiful natural color scheme: dark brown, orange and tan. I added gold candles and some small touches of gold sprinkles for glam. My friend Shea loves her a good Funfetti cake. So I decided to make her a Funfetti cake with white buttercream frosting for her birthday. I wanted the cake to be fun and feminine. Instead of going for her favorite candy I started with a color scheme. 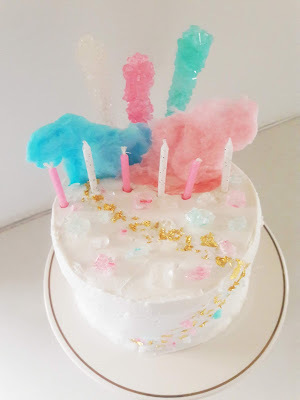 Pink, light blue and gold. 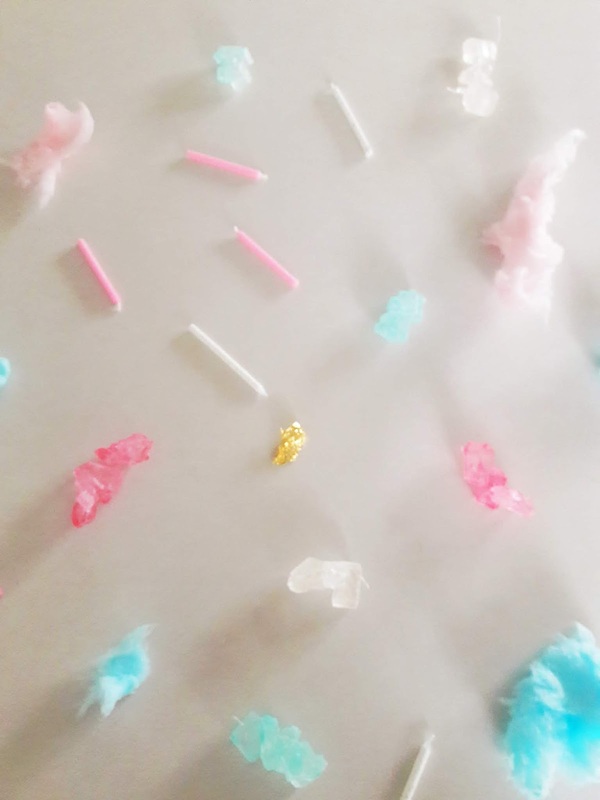 Rock Candy, Cotton Candy and Edible Gold Leaf. I wanted the Gold Leaf to be the main feature so I placed it on the front center of the cake and carried the design through the top. I placed small pieces of Rock Candy around the Gold Leaf to add some color. 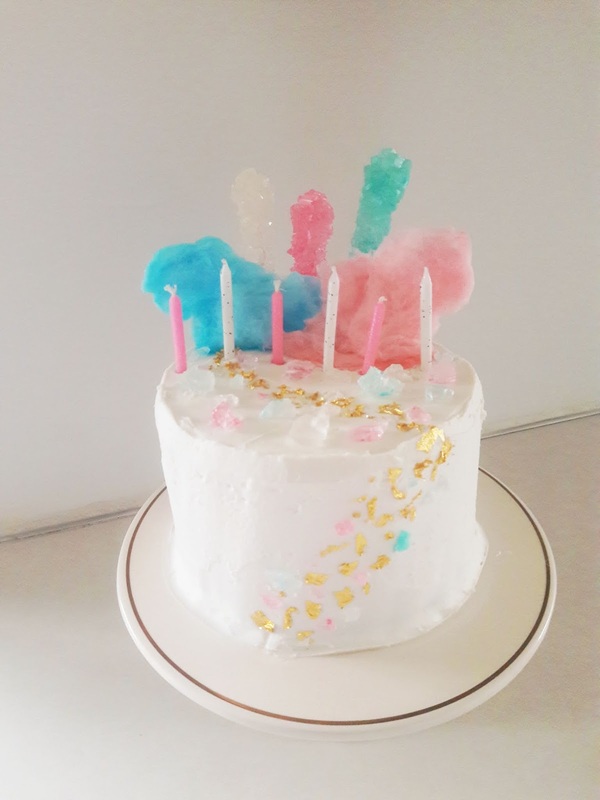 I added the rest of the candy to the top of the cake and added some fun sparkly pink and confetti printed candles. Since their were so many fun pieces to this cake I kept the decorations mainly on top. 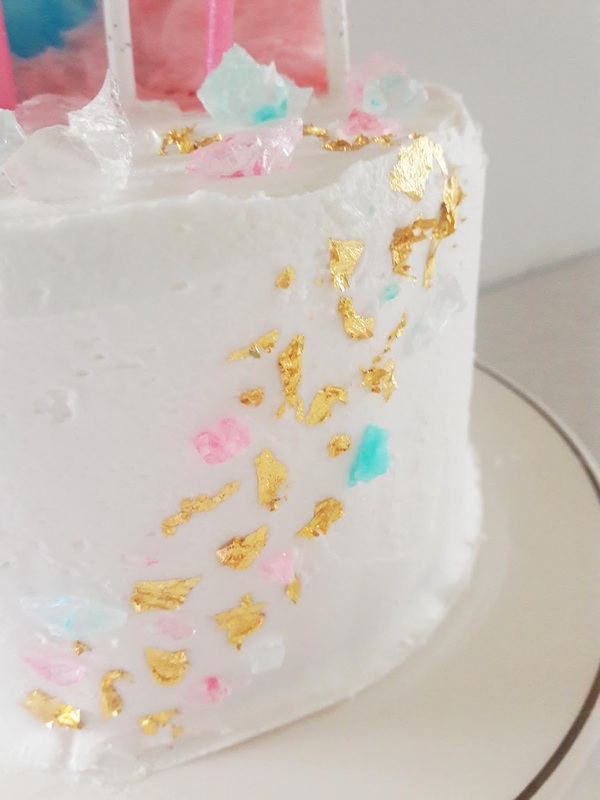 I didn't want the decorations to look overwhelming and keeping the decorations on top let the Gold Leaf really stand out on the front of the cake. Theses cake were so fun to make. I loved the creative process of designing a cake based on the person. Adding personality to a cake doesn't have to be complicated. You can go as simple or as extravagant as you want. Make the cakes from scratch or buy a cake from the store and add your own features. It's simple, fun and easy. Which cake would you want for your birthday?